The SENSOLUX is an intelligent shaker tray with an integrated sensor system. It is used for monitoring the pH value and the dissolved oxygen (DO) saturation during the cultivation of animal and human cells. 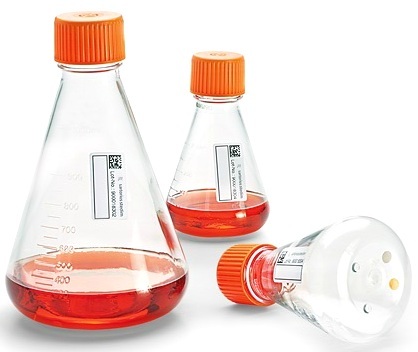 In combination with the new single-use SENSOLUX EF Erlenmeyer Flasks, it facilitates the easy, safe and highly informative online measurement of pH and DO in shaking incubators. Each single SENSOLUX EF flask contains two pre-calibrated sensor patches for pH and DO. 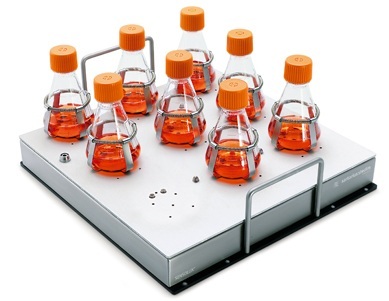 The SENSOLUX shaker tray features nine independent optical sensors. 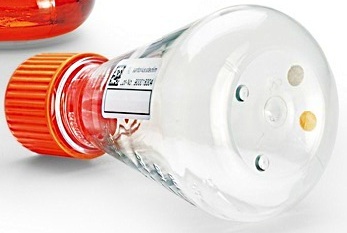 The actual measurement is performed optically and non-invasively from outside of the flask. The sensor patches contain fluorescent dyes, which can be excited with light of a given wavelength. Optical fibers integrated in the shaker tray transmit light of a particular wavelength to the sensor patches and transmit the luminescence response from the patches to a measuring amplifier. The characteristics and intensity of the light emitted is influenced by changes in the concentration of the parameters pH or DO within the flask. The tray has a size of 420 mm × 420 mm and is compatible with a broad range of standard incubation shakers including the CERTOMAT shaker and shaking incubator family by Sartorius Stedim Biotech, such as the Certomat BS-1. The SENSOLUX shaker tray is a powerful tool for significant results in the early process development phase, such as for advanced clone screening and media optimization. 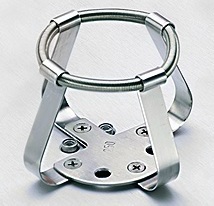 DCS-C2 SENSOLUX C 250 stainless steel clamps for SENSOLUX EF 250 Erlenmeyer flasks (250 ml), 9 pcs/case. 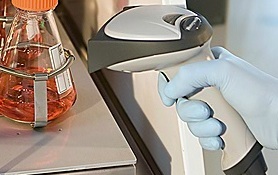 DCS-B1 SENSOLUX BCS Barcode Scanner for the easy transfer of the sensor calibration data of the different SENSOLUX EF Erlenmeyer flasks.